Rare, elusive, and beautiful, snow leopards are known as “the grey ghost of the Himalayas.” Everett, the Zoo’s snow leopard, is the oldest of his species in any zoo accredited by the Association of Zoos and Aquariums. The Zoo’s female snow leopard Zoe passed away on Thursday, February 14, 2019, at the Santa Barbara Zoo. Though she was advanced in age and being treated for related ailments, her death was sudden and unexpected. Results from a necropsy will not be available for several weeks. Zoe was born on May 18, 2003, at the Akron Zoo in Ohio. She arrived at the Santa Barbara Zoo in 2010. Everett is six years older and arrived at the Zoo in 2011 from the Lincoln Park Zoo in Chicago, Illinois. (See “Unusual Companionship”, below). Zoe will be missed by her Zoo family, and by the thousands of guests who met her at the Zoo. She was a beautiful ambassador for her species, which is highly endangered in the wild. In the wild, adult snow leopards are solitary unless it is mating season or a female is raising young. So it was a rare treat that the Zoo’s two snow leopards got along. Though Everett has a genetic disorder that made him sterile, he showed an unusual amount of interest in Zoe when he first arrived. Keepers did careful introductions, and the two became contented companions. Prior to her death in February 2019, Zoe and Everett romped together and even cuddled. Everett likes icy treats, and enjoys the snowy enrichment at the Zoo’s Snow Leopard Festival, held annually the first Sunday in December. Everett is scent-driven and loves fresh pine boughs. He has been known to roll in them and drool, much like a housecat with catnip – which he also likes. ”Known as the “grey ghost of the mountains,” the solitary snow leopard is shrouded in mystery and its elusiveness has prompted much speculation and legend over the years. Leopards are generally said to be closely linked to shamans, and the snow leopard totem in particular represents inner knowing and respect for the mysteries of life and death. Thick fur insulates snow leopards from extreme hot and cold. Usually associated with the Himalayas, they have been found as high as 19,600 feet in summer months. But snow leopards’ southern range also includes Mongolia’s Gobi region, where temperatures can top 100 degrees. At the Zoo, keepers only take special measures on the rare occasions that the temperature rises above 85 degrees, when they run the sprinklers, freeze Everett’s food, and provide special icy treats. In September 2017, the International Union for Conservation of Nature (IUCN) announced that the snow leopard has been downgraded from “endangered” to “vulnerable” on the Red List. Preservation efforts are paying off, but the species is still at high risk due to habitat loss, diminishing prey, competition with livestock, and poaching. Recent estimates put the global population at around 4,000, which is on the low end of the scale between endangered (less than 2,500 mature individuals) and vulnerable (less than 10,000 mature individuals). In October 2013, officials representing 12 Central and South Asian countries endorsed a new global conservation initiative to sustain the cats’ mountain-steppe and mountain tundra ranges. 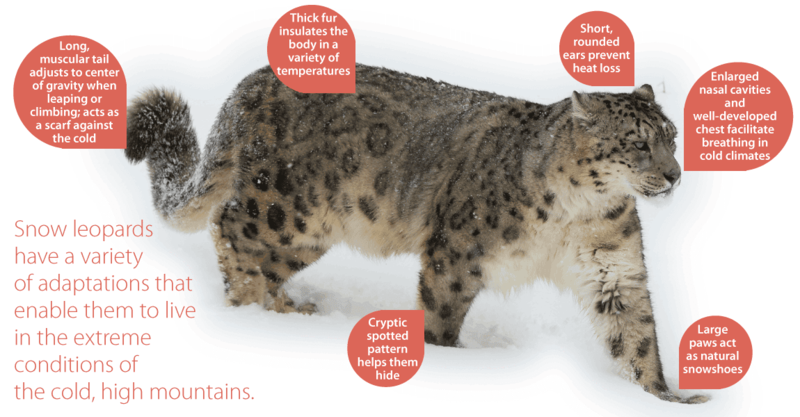 The Snow Leopard Trust is an organization that strives to protect snow leopards and provide a stable income for people living near these majestic cats. Stop by the Zoo’s Explore Store and check out the handmade merchandise or visit www.snowleopard.org.